Relevance The human mammary luminal epithelial cell line MTSV1-7 was transfected with an ERBB2 expression vector, enabling over-expression of the ERBB2 proto-oncogene. It allows in vitro study of ERBB2 proto-oncogene over-expression in human mammary epithelia adn of the effects of ERBB2 over-expression on epithelial morphology & adhesion. The over-expression of the ERBB2 receptor inhibits morphogenesis in vitro, and induces reduced expression of surface adhesion molecules as E-Cadherin and a2 integrin, suggesting a role for ERBB2 over-expression in tumour progression and metastasis. Production Details MTSV1-7 transfected with SV40 plasmid DNA; MTSV1-7 ce1 line transfected with plasmid constructs for pSV2-erbB2 and pSV2neo. Recommended Growing Conditions DMEM + 2mM Glutamine + 10% Foetal Bovine Serum (FBS) + Insulin (bovine) at 10ug/ml +Hycrocortisone at 5ug/ml. D'souza et al. 1994. Proc Natl Acad Sci U S A. 91(15):7202-6. PMID: 7913748. Overexpression of ERBB2 in human mammary epithelial cells signals inhibition of transcription of the E-cadherin gene. D'Souza et al. 1993. Oncogene. 8(7):1797-806. PMID: 8099725. 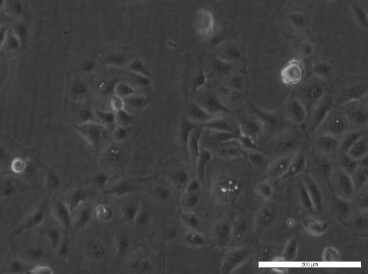 Collagen-induced morphogenesis and expression of the alpha 2-integrin subunit is inhibited in c-erbB2-transfected human mammary epithelial cells. Bartek et al. 1991. Proc Natl Acad Sci U S A. 88(9):3520-4. PMID: 1708884. Efficient immortalization of luminal epithelial cells from human mammary gland by introduction of simian virus 40 large tumor antigen with a recombinant retrovirus.